So my filing system is breaking down….literally. 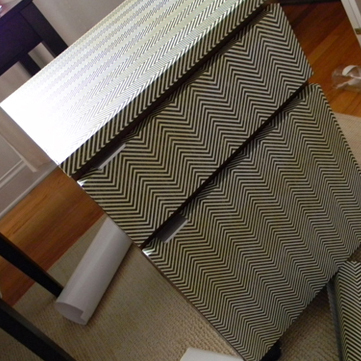 Not only am I outgrowing my little box from Target, but I have resorted to duck tape as corners burst at the seams and the hanging bar falls out once a day dropping all the files…awesome. I have considered a rolling filing cabinet for awhile, maybe to slide under my desk – but didn’t want to commit to the $279 cabinet of my dreams when I don’t even have the $299 white parsons desk of my dreams yet to go with it. So I headed to Craigslist for a reasonable solution and found a posting for this one – $40 for which I offered $30. Done. I thought about wallpaper, or fabric, both still taking a bit of work (can you tell I was in an ultra QUICK FIX mood??) And then I flashed back to CONTACT PAPER – did you ever cover your books with that stuff in school like me? And push out all the bubbles? Yes, I was a freak about the bubbles. Well, I wondered if they still made the stuff, and if it was possible that it came in more trendy patterns and choices than in the 80s. This is the aisle at Joann’s Fabrics…..The answer is yes! I choose this Chevron pattern (yes, that obsession hasn’t subsided) that seemed magically to be the colors of my rug and desk combined. At $19.99 it even has squares on the back for easy measuring/cutting. There were so many choices, and you could even use shape details on it if you wanted, like flowers coming up the sides, etc. Maybe cute for a little kids dresser. Just sayin. Using something heavy and flat like a metal ruler worked great to press it down and smooth it out as I went — see, no bubbles. SANITY TIP: If you can fall in love with a PATTERN versus a solid color it will be MUCH more forgiving on the bubbles. Did NOT even bother covering the side. Barely see it and don’t mind the contrast. 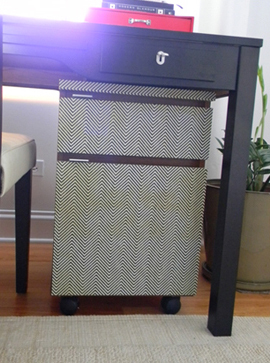 File Cabinet – $30 / Contact Paper – $19.99 / Time – 1Hour / No painting – priceless!